These days I am normally back in Amsterdam on Sunday nights, but yesterday I had the rare opportunity of watching the seven a side CIS football team. 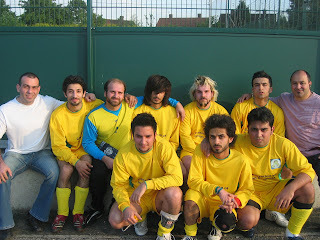 My friend Kamran and I make a small contribution by sponsoring the team in the London Power League tournament. These boys have all suffered in one way or another from the Islamic Republic, yet they have shunned the established Iranian political groups and 'parties' who have either done nothing but talk in the last 28 years or have lost the trust of the Iranian people. "They came, they sat, they talked and then went away"
Money that can be better spent in attracting and involving the huge silent majority of people who loathe the Islamic dictatorship in Iran and want to do something about it, is instead spent on hotel and travel tickets of spent personalities whose result of three decades of 'activism' amounts to naught. I rather be amongst these talented and determined youngsters than the old wind bags of the Iranian exiled opposition who are only capable of writing an article or holding an interview on VOA, saying the same old things again and again. A lot of credit must go to Saman, who in my absence from London has formed the CIS team and worked diligently in all the organisation needed. Lets hope we make Iranians proud by performing well but most important of all by displaying good sportsmanship throughout the league matches.